This is a terms and conditions document for a shop fitter. It is assumed that the business is operated through a company and may be of any size. Although you will edit this document to create standard terms, you will probably be willing to make small changes for each client or to accommodate different types of work. This is a terms and conditions document for any shop fitting company to present to a client, project by project. It is suitable for a business with three employees to one with 300 employees. Many options make it very easy to edit to your exact requirement. You can still accommodate changes on a project by project basis. It does not include a draft specification of work because each business prepares its specifications in a different way. However, it does include alternative procedure for the management of a project as well as legal provisions. 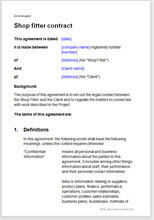 You can use this document either as a fixed set of “terms and conditions” or more flexibly, tailored to each project or client. It is the only terms and conditions document you will need. each side to appoint some person as the “representative” for the purpose of efficient liaison, with meetings where decisions can be made. the shop fitter lays down exactly what work it will do and how it will be done, giving confidence to his client, but without accepting too tight a framework. a design approval procedure (optional, of course) whereby the client has the opportunity to see more than one design option, but he has to pay the shop fitter for the design work he rejected. the client to provide a safe working environment, statutory permissions and of course insurance - a collection of obligations to make the shop fitter’s work as easy as possible. deals with procedure for contract variations and many other provisions designed to smooth the way for the shop fitter and make as certain as possible that he will be paid on time. This is a document protects the shop fitter powerfully, but has been carefully drawn so as to avoid worrying his client. Like all Net Lawman documents, this one is written in plain English and updated regularly. It has been written by an attorney with broad experience of the real world. It is “real law” made easy for any “self-lawyer” to use. Design approval procedure - client cannot say no forever!